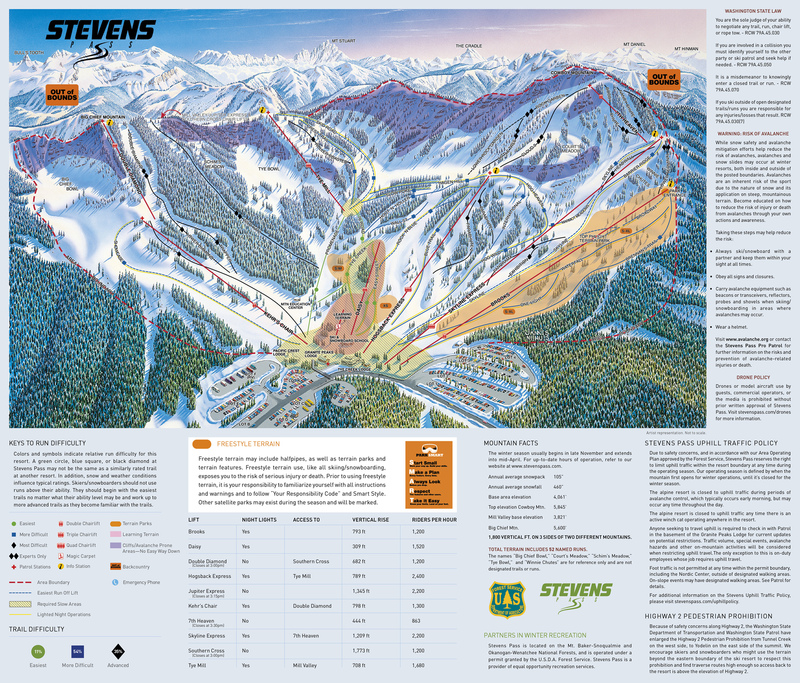 Stevens Pass is the most significant resort in the Seattle area, in the snowy North Cascades. 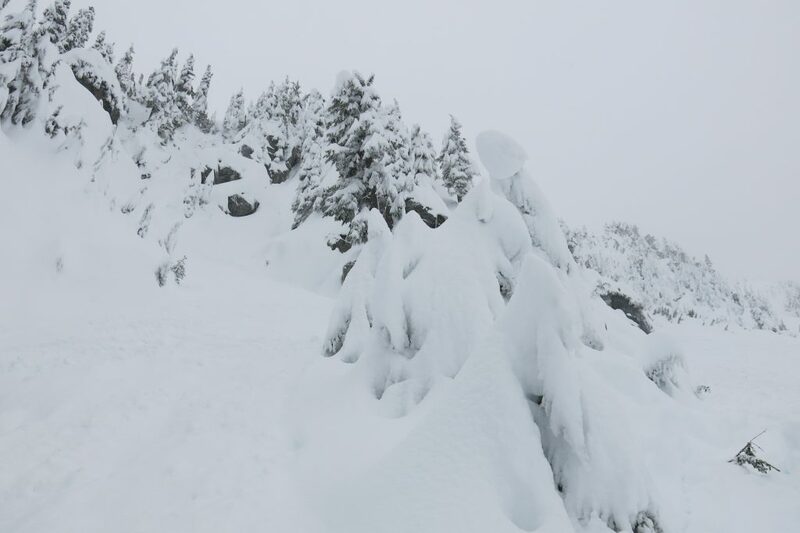 Stevens has a mixture of very steep terrain and more accessible intermediate terrain, and that along with its proximity to Seattle means it gets some well-deserved big weekend and holiday crowds. Doing this review for Stevens Pass is a little difficult. 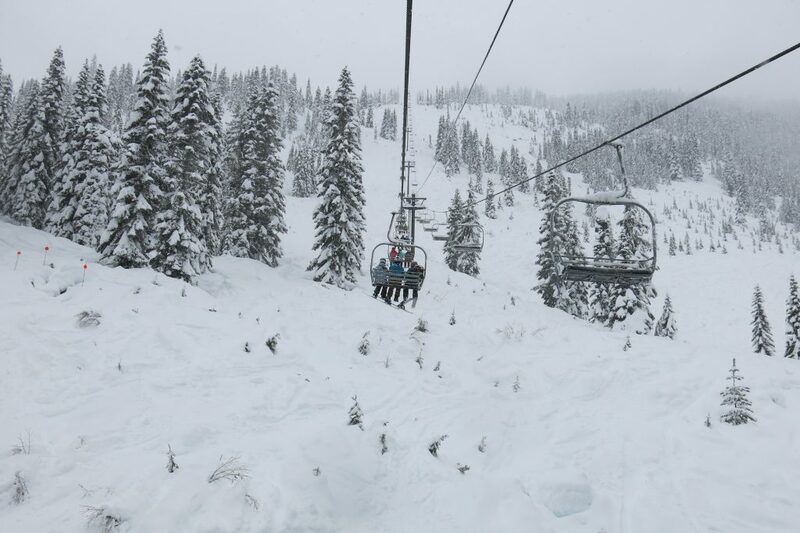 This is the type of place we typically love, with lots of steep challenging terrain and an efficient lift layout. The problem is that the two times we’ve been there the conditions have been bad, and we understand this is a common situation. Warm, moist air from the Pacific results in rain or wet “Cascade Concrete” snow, and then the flow frequently reverses and cold air flows in from the east, turning everything to ice. We experienced both of those things the 2 times we were there. The first time in 2009 about 5′ of snow the week before solidified into solid ice when the easterly flow ushered in cold air with a high temperature in the teens. It was almost unskiabe and many of the lifts were closed. The second time was on our annual Christmas to New Years trip when we were finishing off the Cascade resorts on our list. 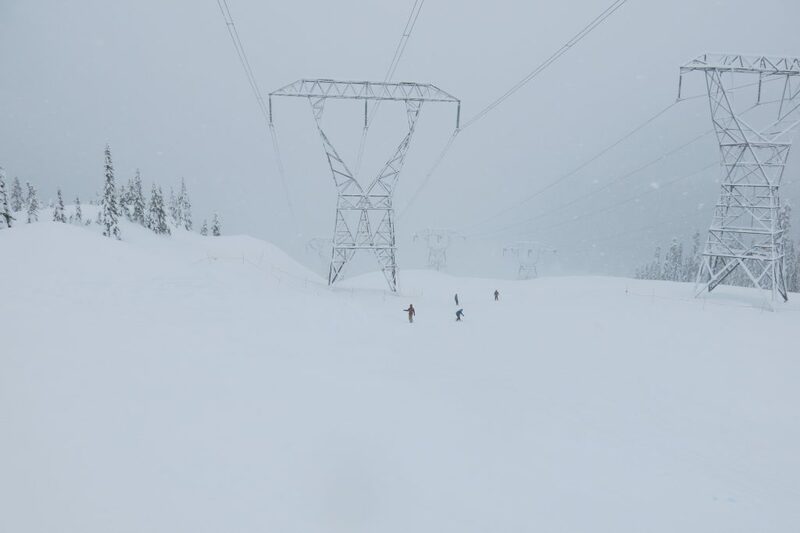 We drove from White Pass where we had skied the day before to Stevens Pass in a blizzard. It was actually snowing harder on the eastern side of the range, and the temperature rose as we got closer to the summit. The snow was falling at about 32F and the next morning we had 16″ of wet cement. 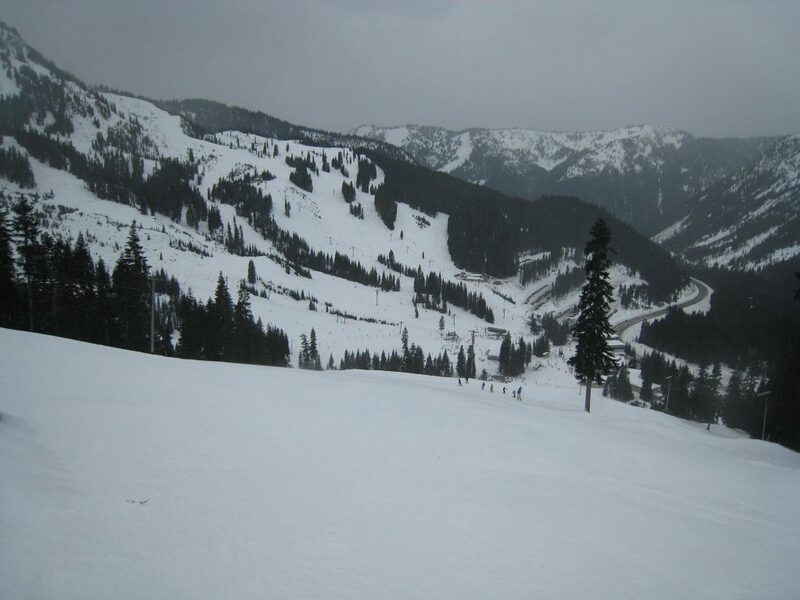 There is an interesting thing about the resorts in Washington in that other than White Pass there is no slopeside lodging at any of them. That means a long slog on windy roads in heavy traffic and frequent snowfall or rain. 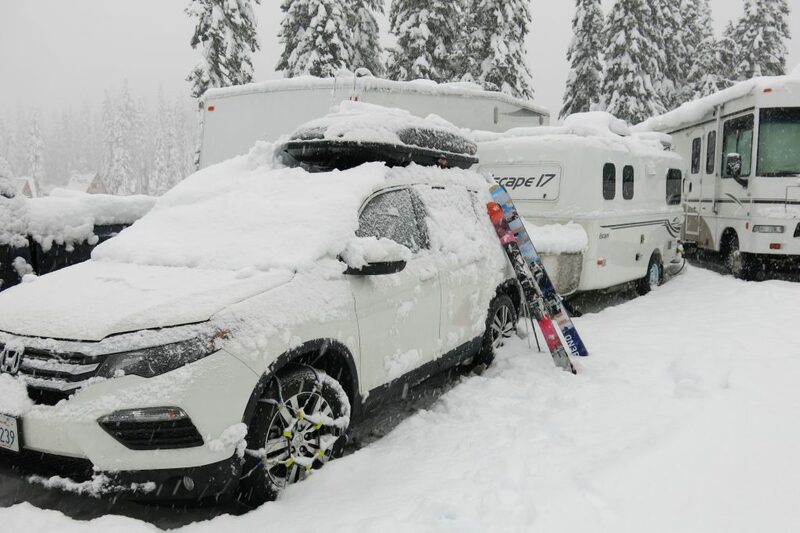 This is why all of the resorts allow RV parking. 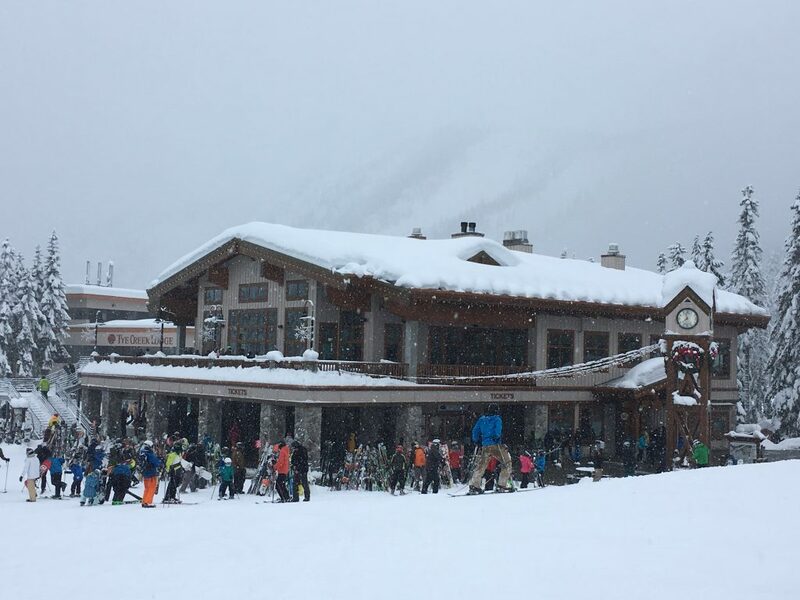 Stevens Pass charges $40 a night but has electric service. They had received a ton of snow in the week before we stayed there, and since there is a pretty steep driveway to get up to the RV lot and we ended up getting stuck. We eventually made it and found that our spot was taken. Long story short they found us a spot but it took 1 1/2 hours in heavy snowfall to get situated. Add to that the fact that snow removal operations were going on all night with backup alarms and it wasn’t a very restful night. The next morning the avalanche bombs were going off fast and furious for a couple of hours. Our dog Sammy is terrified of fireworks so that was another unfortunate thing we had to deal with. The lifts were on a snow safety hold so we got started a bit late. 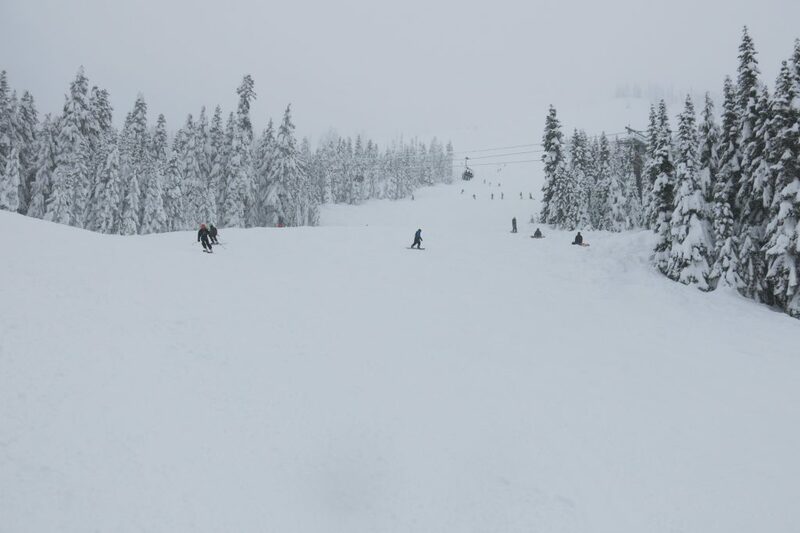 We started on the Hogsback Express and Skyline Express on the frontside. These have a nice variety of intermediate and advanced runs. A lot of these runs are lighted for night skiing. This was all AiRung could handle due to the very deep and heavy snow so she stayed there while I explored the rest of the mountain. At the top of the Skyline Express it gets interesting on the 7th Heaven chair. This has got to be one of the steepest chairs I’ve ever seen. 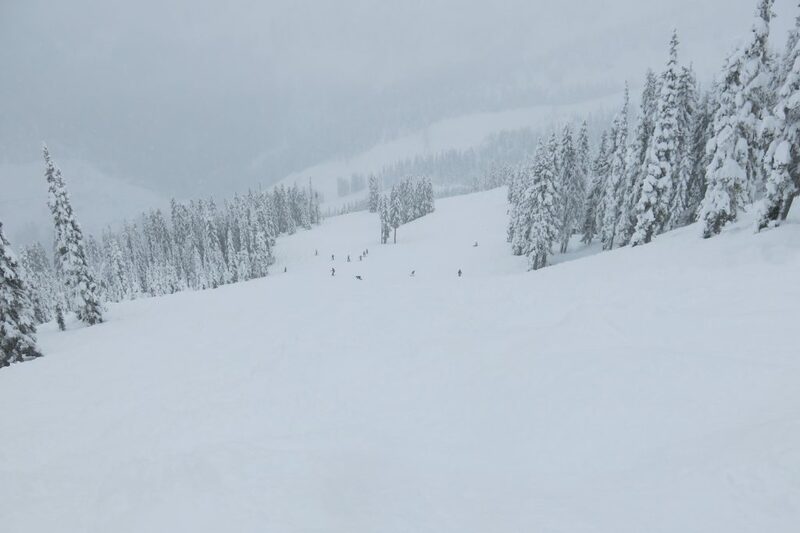 All of the runs off of there are double-black and seriously challenging. 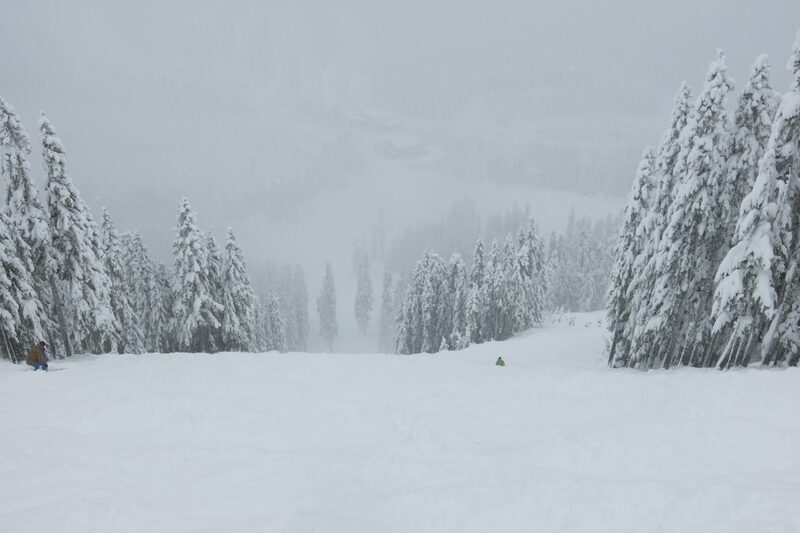 The heavy snow at Stevens Pass sticks to some very steep slopes so there are things off that chair that hold snow that wouldn’t usually even be skiable. Tye Mill is one of the access points to the very popular backside terrain. There are a couple of shorter intermediate runs off the chair that are also lighted for night skiing. This is actually an important ski pod because it’s the only easy way to ski back to the frontside from the back, and it’s the highest north-facing intermediate terrain on the mountain. 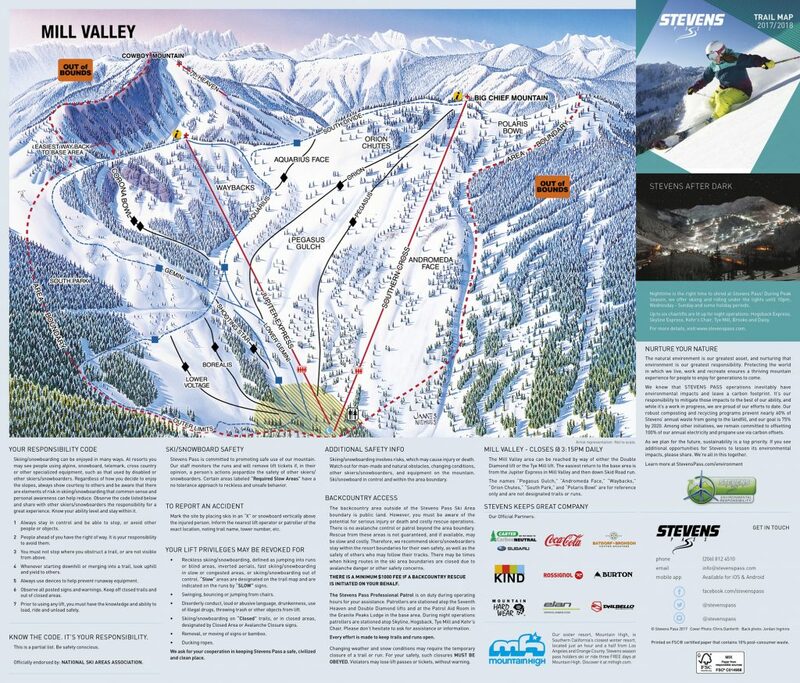 Other than the 2 frontside high-speed quads, everyone loves the backside Mill Valley and the Jupiter Express. 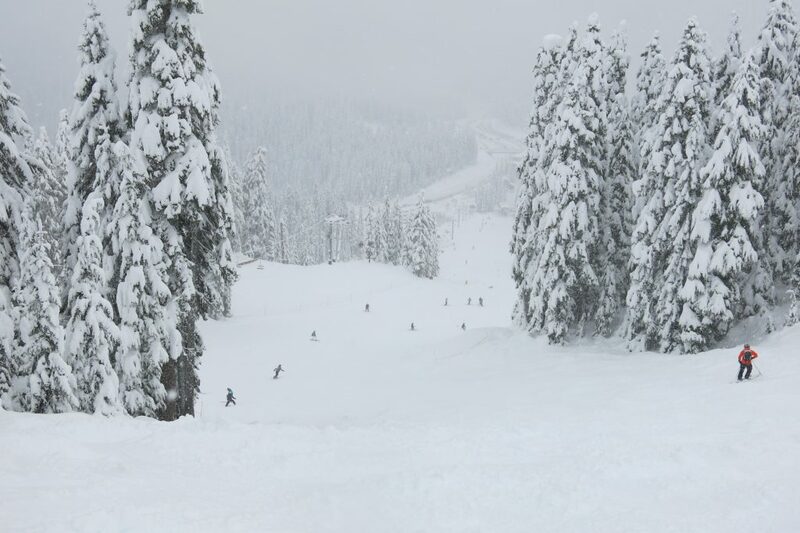 There are a couple of long rolling intermediate runs that are the perfect slope and the Jupiter Express has some good vertical drop at over 1300′. An interesting feature is the 3 or 4 high-tension power lines going directly over the Gemini run. They were crackling very loudly in the light snowfall when I did that run. 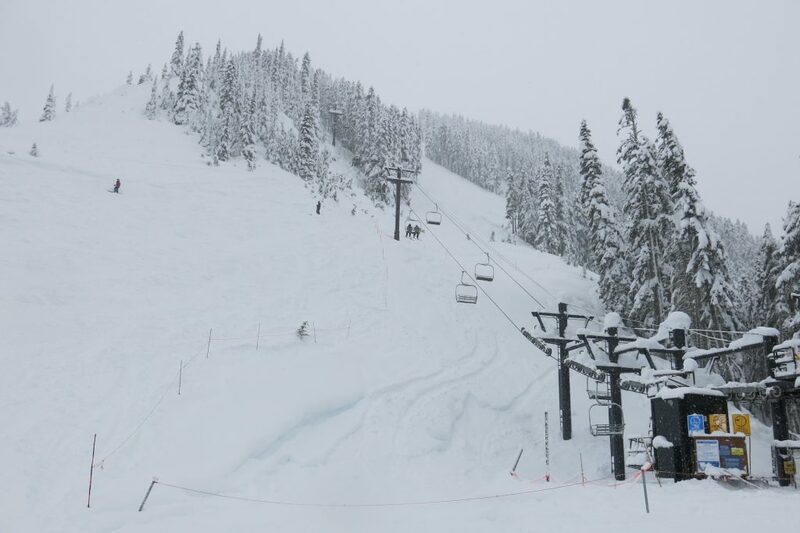 The main pod for powder skiing is the Southern Cross lift. With almost 1,800 vertical drop it’s the biggest on the mountain and it’s a real leg burner from the top on a heavy powder day. 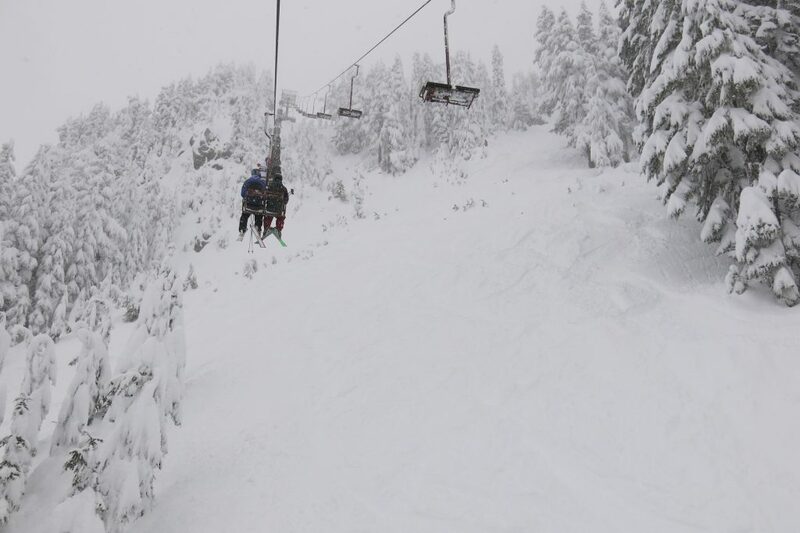 There are some nice places to ski in the trees which is rare in the Cascades due to the density of the forest. You can drop directly down to the frontside from the top of Southern Cross on Double Diamond. That is an aptly named double-black trail that is pretty much the only trail that the short Double Diamond lift serves, but it is really wide and a nice slope. On a powder day people line up for the double Kehr’s chair to link up with Double Diamond which is the fastest way to the top of Southern Cross. Kehr’s chair doesn’t get much traffic but does serve one of the nicest sloped intermediate runs on the mountain Showcase, which is also lighted for night skiing. So in the end Stevens isn’t really a destination-quality resort due to the proximity to Seattle and the low elevation and funky weather, so it gets a low score from us, but for locals in Seattle it is the place to go for steep challenging terrain. You would definitely have to pick your days, but if you hit it just right I’m sure it’s great and I’m sure I would have a season pass there if I lived in Seattle. No, but we think this would be a great place to day ski when the conditions are right.